In a rapidly changing industry, innovation is key. We’re excited to support young minds with a passion to change the landscape of logistics. 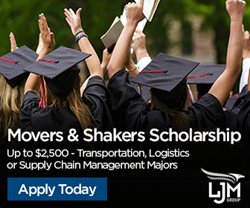 Following their belief in social and civic duty, LJM Group is proud to offer transportation, logistics, and supply chain management students the opportunity to win up to $2,500 towards their college expenses. Funded entirely by LJM, the Movers & Shakers Scholarship is an annual scholarship offered to qualified students and researchers looking to make a difference by reducing supply chain costs without compromising customer service. There are two levels of scholarship opportunities being offered. $1,000 per academic year is available for students submitting a 500-word essay introducing themselves and outlining their career goals in today’s supply chain community. $2,500 per academic year is also available for students submitting either an 800-word essay outlining their career goals in today’s supply chain community and discussing a logistics or ecommerce trend that is changing the face of global supply chain OR a 400-word essay accompanied by a video outlining their career goals in today’s supply chain community and discussing a logistics or ecommerce trend that is changing the face of global supply chain. The scholarship is available to full-time Junior and Senior undergraduate students as well as PhD and Masters-level students conducting research in transportation, logistics, or supply chain management while maintaining a cumulative GPA of 3.0 or higher. In order to apply, at least one letter of recommendation, along with unofficial school transcripts and any other materials supporting the requirements must be enclosed with all applications. Letters of recommendation may come from faculty members familiar with the applicant’s coursework, a direct supervisor who can comment on work experience, an individual who made it possible for the student to attend an industry event, or anyone who can verify the student’s connection and commitment to the industry. Applicants are also encouraged to include additional supporting documentation such as a resume, research papers or project summaries. To apply for the scholarship by the April 15th deadline, follow the link below. LJM’s extensive industry experience delivers established long-term strategies to reduce overall shipping spend with proven quantifiable results. Since 1998, we have been helping parcel shippers improve their profitability with expert Parcel Consulting services. LJM’s renowned strategists and negotiators hold multidisciplinary tenure with the largest Carriers and have developed numerous pricing and cost models. Our Parcel Invoice Auditing and Carrier Contract Negotiation services typically save our clients as much as 25% per year upon partnering with us.